Brudder 's business plan provides another example of a company meeting a need caused by changing environmental government regulations. Several major auto manufacturers recently announced a joint venture which involves the construction of a $25 million powder coating facility. Their new state-of-the-art facility will be used to expand the uses of powder coating in the automotive industry. This is one of many indications of the accelerating growth of powder coating as an alternative to painting in industrial metal finishing applications. Superior durability, reduced costs and environmental considerations have played a role in the movement of manufacturers throughout the world from liquid paint to powder coating. Powder coating now comprises 15% of the market for metal finishing where it competes directly with traditional liquid finishes. Powder coating is a finishing process where finely ground particles of pigment and resin are electrostatically charged and sprayed onto a conductive part (usually metal). The coating process can be done manually or automatically with a wide variety of equipment. The parts to be coated are grounded neutral so that the charged particles projected at them adhere to the parts and are held there until melted and fused into a smooth coating in a curing oven. The result is a uniform, durable, high-quality finish that is resistant to chipping and scratching, and has a very high tolerance to heat. Powder coating is a very environmentally friendly process. It is a dry process that does not involve the spraying of volatile and toxic chemicals into the air. Applications for the use of powder coating vary widely. The appliance and automotive industries are large users of powder coating for cabinets, hardware, trim and underhood parts. There are also large markets for powder coating in architectural metal, industrial equipment, furniture and sporting goods. The mission of Brudder Coating Systems during our first three years of operation will be to provide quality powder coating services to a variety of clients. Our long-term goal in entering the powder coating industry is to identify areas of opportunity in the industry that will allow us to begin a manufacturing of value-added business that utilizes powder coating in the process. In an effort to move us toward this goal, the owners of Brudder have developed several consumer products that will be marketed by a recently formed sister corporation, also owned by them; The Spice Company. Additionally, Brudder has recently obtained a distributorship for Metal Finishing products. These products will be a good compliment to Brudder's powder coating services since the market for the products is very similar to our market for powder coating services. We will also attempt to develop innovations in the powder coating process that will allow us to either manufacture powder coating equipment, or do systems consulting and sales of existing equipment for the many businesses worldwide who will be converting from liquid paint to powder coating over the next decade. During the first 19 months in operation, Brudder has established powder coating business with over 20 industrial customers, from the region and as far away as Milwaukee and the Wisconsin Rapids. Our initial market survey of manufacturers in the region has identified over 350 potential customers for Brudder's powder coating services. The survey also identified four potential competitors within our defined geographic market, and five other manufacturing firms who have in-house powder coating operations. Brudder began operations during August of 1994 in a manufacturing facility where they currently lease 2,500 square feet of manufacturing space and a 250 square foot office. The operation is currently staffed by the two owners of the business, one full-time employee and one part-time employee. We hope to add at least four additional employees within our next year of operation, and grow to approximately 12 employees within our first three years. Brudder's powder coating equipment currently includes high pressure cleaning and phosphatizing equipment, a spray booth and sprayer and an oven. 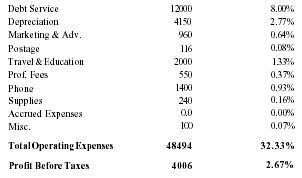 The start-up cost for equipment, fixtures, materials and working capital was approximately $50,000. To date, the business has been financed by the stockholders in the business and from operations. In anticipation of future demand for our services, a detailed expansion plan has been drafted and price quotations have been obtained. The expanded plant would include an automated powder coating line which would increase our capacity approximately ten times over our current capacity. One of the biggest potential powder coating users is the appliance industry. The high-quality finish is both attractive and durable, and a viable alternative for porcelain enamel and liquid finishes on traditional appliances surfaces. These include dryer drums, front and side panels of ranges and refrigerators, washer tops and lids, air conditioner cabinets, water heaters, dishwasher racks and cavities of microwave ovens. Technological developments have resulted in powder coatings with lower gloss, lower temperature curing requirement and stronger resistance to chips, scratches, detergents and grease. All these features have led to the use of powder coatings on about 40% of all appliance finishes. Appliance applications represent about 21% of the North American powder coating market. The automotive industry represents an additional 15% of the North American powder coating market. Wheels, bumpers, roof racks, door handles, interior panels and various "under-the-roof" parts are being powder coated. Powder is also used as a primer-surfacer on component parts for trucks and recreational vehicles. Clear powders, over a liquid base coat, are being developed for exterior auto body finishing. The architectural and building market uses powder coating on file cabinets, shelving, aluminum extrusions for window frames, door frames and modular office furniture. Posts, rails, fencing, metal gutters, highway and parking lot poles, guard rails, farm implements, garden tools and tractors, patio furniture, and other products used outdoors all benefit from the high weatherability factor of powder coating. Countless everyday uses for powder coating include fire extinguishers, mechanical pencils and pens, thumbtacks, barbecue grills and vending machines. Sporting goods equipment uses include bicycle frames, golf clubs shafts, ski poles and exercise equipment. Technological advancements have allowed expansion of powder coating to non-metal surfaces, such as ceramics, wood, plastic and brass so that bottles, shower stalls, dashboards and even toilet seats are now powder coated. Initial marketing efforts were concentrated on a geographic market extending in a sixty-mile radius of our location. After exhausting our leads in this area we expanded our marketing efforts in Minnesota, Michigan and Illinois. We have been successful in drawing business from a much wider geographic radius than we originally anticipated. We have found that we can be competitive with smaller parts that can be shipped over longer distances, and certain types of specialized work justify long distance shipment. To establish a measure of the size of the market for powder coating within our identified geographic market, a telephone survey of regional manufacturing firms was conducted. 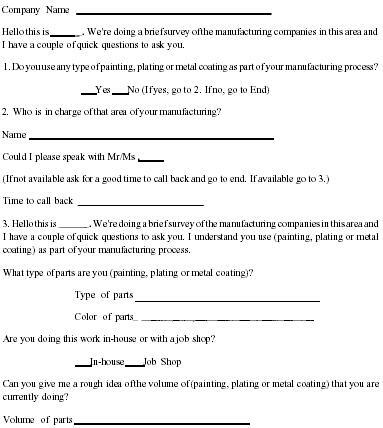 The survey was used to identify firms that are using either painting, plating or other metal coating in their manufacturing process. The person in charge of this process was also identified, and information was gathered on the size, type and color of parts. A copy of the survey instrument is attached. Through this survey and subsequent marketing efforts, we have identified and contacted over 350 manufacturers who use metal finishing in their process and, who could potentially use our services. We are in continuous contact with our prospects and customers to encourage them to request quotes from us. In our first 19 months of operation we have done powder coating for over 20 industrial customers on a regular basis. We have also quoted prices for numerous additional jobs from these customers and prospects. We anticipate that our number of customers and orders will continue to increase significantly over the next three years. There is currently one other powder coating job shop located in the area. There are also several automated lines in the immediate area surrounding the region. The local shop is a small operation that has been in business for about two years. The Kenosha shop is a larger operation. They specialize in military contracts and take in smaller jobs as a sideline. There are also about five other manufacturing firms within our geographic market who have in-house powder coating facilities. Several of these facilities take in outside work, although they don't appear to be a significant competitive threat. We will continue to gather information on competition. We will attempt to determine the volume and type of parts being powder coated by our local competitors, as well as their pricing. A two-tiered pricing structure is anticipated. One tier for coating specialty or one-of-a-kind items which will be billed at a straight per-hour charge, and another tier for repeat or production items. The latter will be quoted according to surface contamination, part size, surface complexity and shipping requirements. Premiums will be charged for colors other than black or white, certain coating materials, masking and special handling. Our research on pricing for powder coating by other shops indicates that they generally charge on a square footage basis. The range in competitor pricing is between $. 10 to $. 12 per square foot. We anticipate that our pricing will fall within this range, with a higher per square foot charge on specialty items, and a lower per square foot charge on longer run items. Advantages: Low rent. Flexible space. Dock-height shipping/receiving facility. Natural gas, 440 VAC 3 phase electric service available. Computer, fax and coffee available. Good central region location. Disadvantages: Work space not custom suited to application. Have to make accommodations for other businesses in building. Three-year tenancy limit. Could easily outgrow available space. Brudder provides powder coatings on conductive metallic surfaces, chiefly not-rolled steel, coldrolled steel, cast iron, stainless steel, rolled or extruded aluminum and cast aluminum. The pieces accepted will vary in size from a few square inches surface area, to 70" × 54" × 63" which is the maximum size capacity of our current oven. Technological advancements have allowed the expansion of powder coating to non-metal surfaces, such as ceramics, wood, plastic and glass. These applications generally require specialized equipment that we will not have initially. If market demand for these types of services is great enough to justify the expense of additional equipment, we will consider expanding our service to include them. Brudder will offer its customers their choice of most types of thick-film, functional end use and thin-film decorative end use thermosetting powders which are currently available. These coatings are epoxy, polyester, new polyester, acrylic, silicone/epoxy, silicone acrylics and silicone. Each material or blend of materials offers unique properties of hardness, color acceptance, flexibility, durability, temperature resistance, ultraviolet light resistance and salt spray resistance. The material to be used in any given application will be determined by consultation with the powder supplier and the customer, using a "needs" checklist. The three major steps in the powder coating process are Surface Preparation, Powder Application and Thermosetting (Baking). Surface Preparation: Of the three steps, surface preparation is probably the most critical. Unlike wet painting with solvent based paints which are somewhat forgiving of scale, grime and forming and cutting oils, the surface to be powder coated must be free of contaminants and have a good phosphatized or conversion coat. Brudder uses a variety of cleaning methods including a high temperature, high pressure phosphate wash, or other cleaning chemicals as the job requires. Additionally, we have identified a new metal finishing process that is an environmental alternative to clean chromate coating on aluminum. Clear chromate is used widely as a corrosion preventative for aluminum computer and electronic parts. It is also a very effective pre-treatment for aluminum before powder coating. We would like to begin offering the service within the next 12 months. The cleaning and coating chemicals are monitored for strength. The rinse discharge is relatively low volume chemically inert substances which will be monitored and balanced for pH. Discharge samples have routinely met or exceeded all federal, state and municipal regulations. After cleaning, the part must be completely dried before powder application. Powder Application: Powder is applied in a spray booth designed specifically for powder coating. Because there are virtually no VOCs in the powder, the spray booth air can be drawn through a two-stage filter and recirculated directly back to the shop. The powder to be applied to the part is pumped from a feeder unit through a hose to the spray gun. There is a high voltage, low amperage electrode at the tip of the spray gun. The voltage can be varied according to the type of powder material being applied and the intended thickness of the coat. As the powder passes it, the electrode applies an electric charge to the powder. The powder emerges as a charged, diffuse cloud that is aimed at the electrically grounded part. As with all spray type applications, there is a certain amount of overspray. Unlike most wet spray processes however, the powder overspray can be recovered and reused. Thermosetting: The coated parts are placed in a preheated oven for thermosetting. The temperature of the oven and the time of exposure to heat vary according to the coating material(s), the substrate material type and thickness of the part. Climate controlled powder storage: Coating Powders have a shelf life of about one year depending on storage conditions. Ideal storage conditions would be in an area protected from rapid temperature and humidity changes. Storage temperature should be at 80 degrees F or less, with humidity ideally at 60% or less. Chemical Storage: While the chemicals associated with our powder coating operations are generally not highly reactive, the concentrations involved would dictate safe and prudent holding facilities. These facilities will comply with or exceed code requirements. All chemicals will be purchased from suppliers and stored in approved containers. Storage containers and operational containers are held within secondary (spill) containment systems. Receiving Equipment: This will be dictated by the marketplace. As our customer base develops, appropriate equipment will be acquired. For starters, only clean, designated areas will be necessary. Shipping Area: A minimum amount of fixtures have been necessary in our operation so far, although the shipping area has the potential of becoming the largest square foot area in the shop. It is planned to offer potential customers the option of light assembly of their product, packaging and shipping to their customer as an efficiency that would greatly reduce extra handling problems. Waste Management: The two most challenging items requiring waste management will be disposal of incoming packaging materials, and discharge of spent cleaning solutions. Incoming packaging materials will consist mainly of corrugated kraft paper and polypropylene sheets. Wherever possible these materials will be reused. If reuse is not feasible, they will be recycled. Liquid discharges will be minimal (should be less than 100 gallons per day of highly diluted waste water). Discharges are being coordinated with city public works department and monitored and adjusted by equipment purchased from chemical suppliers. Product Handling Fixtures: There are three mobile racks sized to fit in our oven, strong enough to carry 250 pounds of product each. The dolly wheels, as well as other parts of the racks are designed to operate in, and withstand temperatures of up to 500 degrees F. These racks have movable hanging bars that can be placed where needed to accommodate various products. Wire hangers are fabricated from baling wire as needed for each product. Wire will be a small but continuous expense because of the rather limited life of an individual hanger. Surface Preparation: The plant is equipped with a high temperature, high pressure cleaning and phosphatizing machine. Each part is thoroughly cleaned prior to coating. The product must be completely dry before powder application. This usually necessitates placing the just cleaned parts in the oven for a short period of time (@5-10 min.) depending on the part(s). Powder Application : The shop is equipped with a walk-in spray booth designed to minimize powder migration within shop confines. The applicator module is an industry standard model which provides the versatility necessary for job shop usage. Accessories and specialized parts will be purchased as the economically appropriate need arises. Thermosetting: A previously owned, electrically heated convection oven has been purchased. While it is not perfect for our needs, it should be sufficient for a start and sufficiently modifiable to provide for some future needs. Conversion of the oven to a more efficient gas-fired unit will be considered when the volume of usage suggests it. The size of our current oven is 6' deep × 5' wide and 5' high. The small size of this oven is also limiting our productivity. An oven 12' deep with doors on both ends would more than double our hourly production capacity. The larger oven would also allow us to accommodate projects involving larger parts (i.e. : automotive and airplane frames, boat trailers and docks) that we are currently turning away. With current equipment our production capacity is capable of generating approximately $28,000 per month in sales. With the addition of a larger oven, priced at approximately $35,000, four additional employees and 1,200 square feet of manufacturing space, we could increase our revenue generating capacity to approximately $40,000 per month. Brudder Coating Systems Incorporated is a closely held Wisconsin corporation. The initial stockholders in the corporation are A. Post and Jane Crew, each with a 50% ownership of the corporation. For 1994 and '95 A. Post will hold the office of President and Treasurer, and Jane Crew will hold the office of Vice President and Secretary. Management responsibility for Brudder will be divided between the two stockholders. A. Post will have primary responsibility for plant operations, production staffing and materials and equipment procurement. Jane Crew will have primary responsibility for sales, marketing and financial management. An internally financed investment of $50,000 was needed to purchase initial equipment and supplies, and to cover operating expenses during the first six months of operations. This amount was financed through a loan to the corporation by A. Post. The loan is a five-year installment loan, with interest at 8.75% annually. The monthly payments are approximately $906. 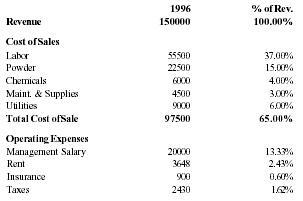 The $17,000 loss from operations that we incurred during 1994 was less than the $20,000 loss that we anticipated during our start-up phase. 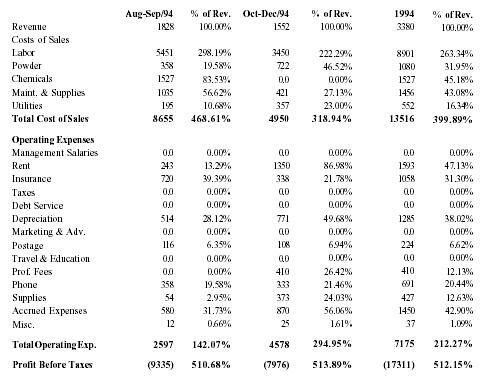 Our budget shortfall in revenue for the first quarter of 1995 was simply due to sales being less than anticipated. 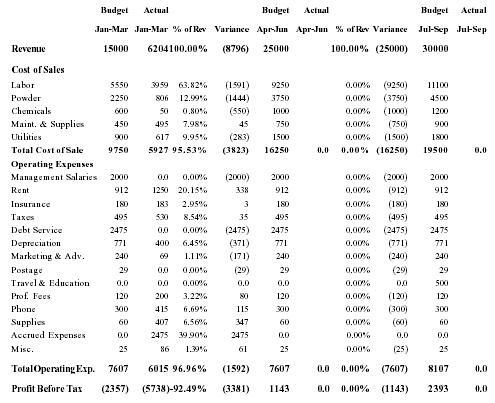 We also discovered that our cost of sales estimates as a percentage of sales were budgeted too high. This indicates that our profitability will be greater than anticipated at a lower level of sales. Based on first quarter sales, projections for the remainder of 1995 may seem to be optimistic, however, based on current purchase orders and work-in-progress, $25,000 in sales for the second quarter is likely. Indications from existing and prospective customers are that sales for the remainder of 1995 will continue to grow steadily. 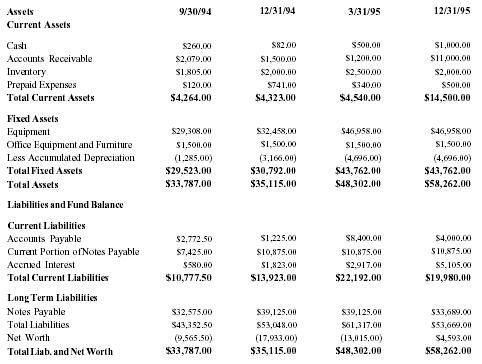 The attached balance sheet shows a positive net worth for Brudder by the end of 1995. We feel that this is also very attainable if sales remain constant through the second-half of the year. During the first eight months in operation it has become apparent that we will need to grow in capacity to keep up with our growing market for powder coating services. The size of our oven is currently our biggest limiting factor. A number of potential customers who would like to work with us cannot because our oven is too small to accommodate their parts. With a larger oven we could take on jobs involving larger parts, and increase our capacity for jobs with smaller parts. The cost for a larger oven which could eventually be incorporated into an automated system is approximately $35,000. As winners of the Industrial and Commercial Development Business Plan Contest, we used the $1,000 cash award and $10,000 interest free loan, along with additional bank financing, and internal funding to purchase additional equipment and pay off start-up debts. Aug-Sep/94 % of Rev. 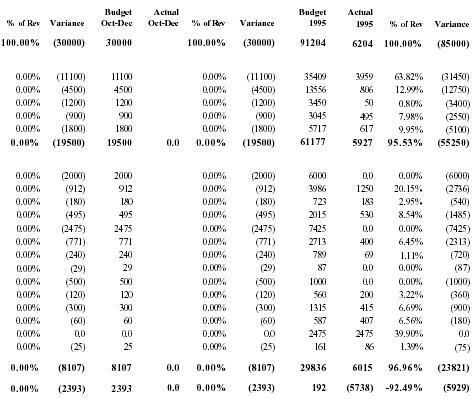 Oct-Dec/94 %of Rev. 1994 % of Rev. Increase infixed assets and long term liabilities in 1995 reflects purchase of new cleaning system.